Revenues for Spirit and Allegiant grew at an average annual rate of 18% over the 2010-2015 period, more than 3.0 times the rate of gains for the total industry. (Frontier Airlines is not a publicly traded company and doesn’t publish financial information). ULCCs compete in the airline industry by offering discounted fares made possible by providing stripped-down service. In addition, ULCCs have found success by serving underserved destinations such as small and mid-sized cities or vacation destinations that were previously deemed unprofitable by larger carriers due to passenger traffic volumes that were relatively low or seasonal. Of the 105 cities served by Allegiant in 2015, 88 were underserved cities and 17 were leisure destinations. For instance, during the period from August 2015 to July 2016, Spirit maintained a 54% share of enplaned passengers at the Myrtle Beach International Airport, while Allegiant registered a 9.8% share. Furthermore, the discount fares offered by ULCCs typically expand the customer base of air travelers. While business and affluent consumers are typical passengers for traditional airlines, ULCCs report that when they establish a presence in a new market, individuals that don’t travel by air become flyers due to the more affordable fares. A key aspect of the ULCC business model involves offering low fares for basic flight services and charging extra for any amenities or conveniences, such as checked bags, food, water, or a printed boarding pass. In 2015, non-ticket revenue amounted to 42% of the total for Spirit and Allegiant, which represented a considerable increase from a 30% share in 2010. Despite the additional fees many customers are likely to pay on top of ticket price when choosing ULCCs, travelers perceive value in the low-cost fare, helping demand continue to increase. In 2015, Spirit increased capacity by 30% and launched service to 40 new markets, including adding Cleveland, Ohio as a new destination. To learn more about the US air transport services industry and forecasts to 2020, see Air Transport Services: United States, a report published by the Freedonia Focus Reports division of The Freedonia Group. 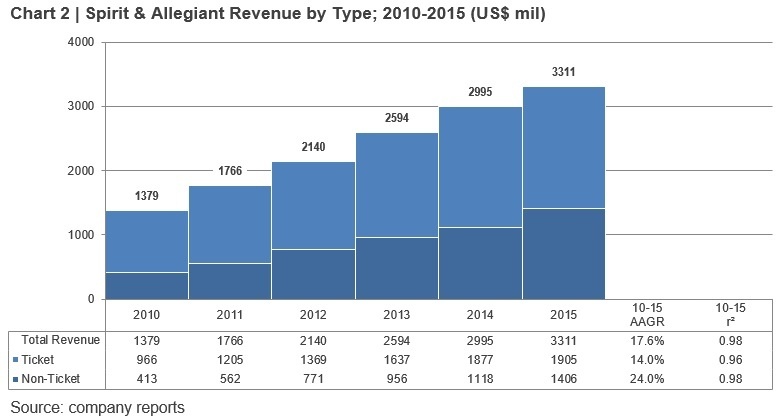 To illustrate historical trends, total revenue is provided from 2005 to 2015, while the segments are available from 2010 to 2015. The report covers both passenger and cargo air traffic. UPDATE: To see the latest research, be sure to read a new article on the airline industry on the Freedonia Focus Reports website.